We’d love your help. Let us know what’s wrong with this preview of Jacob's Room to Choose by Sarah Hoffman. 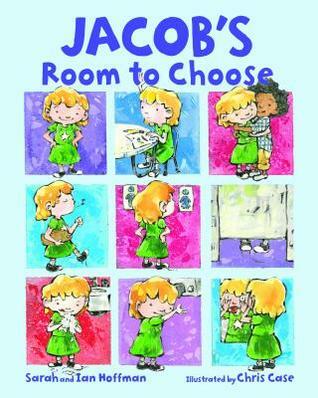 To ask other readers questions about Jacob's Room to Choose, please sign up. This sequel to Jacob's New Dress centers around the problems Jacob and his friend Sophie have when they use the restroom at school. Since Jacob loves to wear dresses, the boys chase him out of their bathroom. The same thing happens to Sophie in the girls' restroom because she is wearing shorts rather than a dress; the girls tell her she has to use the boys' restroom. Luckily, they have an awesome teacher who wants all the students to feel safe at school. She leads the class in an activity about m This sequel to Jacob's New Dress centers around the problems Jacob and his friend Sophie have when they use the restroom at school. Since Jacob loves to wear dresses, the boys chase him out of their bathroom. The same thing happens to Sophie in the girls' restroom because she is wearing shorts rather than a dress; the girls tell her she has to use the boys' restroom. Luckily, they have an awesome teacher who wants all the students to feel safe at school. She leads the class in an activity about making assumptions based on appearance, then asks the question. "I wonder if there is another way?" The problem-solving that the kids do is helpful and positive. The authors include a letter in the back of the book that explains how their son's experiences as a young child who did not dress in the expected gender-conforming style caused stressful situations and even violent reactions by other boys - especially in restrooms. Their own knowledge of the difficulties for children in those situations led them to write both these books to help others understand. This would be a helpful book for families dealing with similar situations, or for teachers like Ms. Reeves who are trying to provide a safe learning environment for all their students. As a homeschool mom and even though I am open minded. Well I think so. The book made me uncomfortable and I actually did not want to read it to my kids. I know this is going to open some doors for discussion and I know the world is going crazy with all these new things that are very real to some people. I do not not feel safe with another person of any gender in the bathroom when I am using it no matter where I am. The book takes something that could benefit adult I received a complimentary copy. What a wonderful picture book to continue the conversations around gender identity and expression. Important for kids to learn to respect others despite differences-as we all know, not everyone falls into a specific category, and this is the book to teach kids that this applies to gender as well. Thanks to an understanding teacher Jacob and Sophie, who have been bullied by their bathroom choices, find a way to make everyone comfortable. Their classmates are reminded that at home everyone shares a bathroom and that they way we look does not necessarily describe who we are. Needed book for the issue of non-conforming children and the public rest room. Read while in line to get author’s autograph. Important topic that needs to be addressed more openly and honestly. I read an Advanced Reader Copy of this title. I loved the premise about what we assume when looking at someone. A very timely picture book which hopefully lots of adults will read. Sequel to Jacob's New Dress.